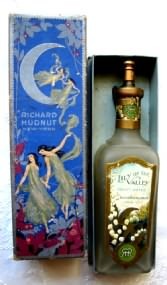 This empty Richard Hudnut Lily of the Vally perfume bottle comes in its orginial box. Both are in excellent condition. Circa 1920. Price not set. Serious offer considered. Sorry, this item SOLD. 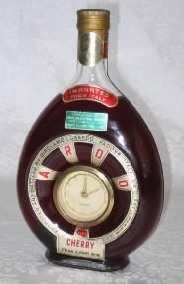 This is an Italian cherry wine bottle with a German made clock. Imported from Italy, it dates from the 1950's. This vintage wine bottle has never been opened and is full. It is 6 inches high and at its widest has a 6 inch diameter. The Mercedes brand clock was made in West Germany and currently does not work. This is a one-of-a kind nearly 60 year old bottle.